I watch at the iPad screen as my 4-yr old points me to a score of 137,298. He cannot read yet, but knows it’s a big number judging by the long sequence of digits. 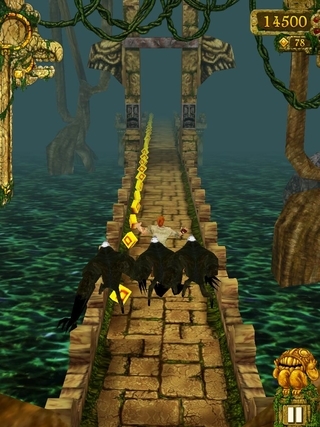 This is his personal new-high in Temple Run – the mobile video game where you as a treasure hunter, have to outrun demon monkeys, deadly traps, and other obstacles, while collecting gold coins on the way. Running is all that matters! The score has intrigued me. Especially since that kind of number never ever flashed up during my casual-yet-competitive video-gaming endeavors to-date. I decide to watch him. I want to know how he does it. But the next few tries does not prove to be that lucky for him. He has not hit the 100K mark. Though the mom in me is happy, the spectator in me is losing interest. I walk away thinking this would be the end of his playing session. But five minutes later, he’s back with a happy squeal. “Great. How did you do it?” me, trying to show enthusiasm. “If you keep trying, you can reach bigger score also”. In fact, I get inkling that he’s learnt his first lesson in risk-taking. Evaluate your options. You need to forgo gold coins at times, especially when they come at a higher cost. But I can’t help myself prompting him whenever I see a long sequence of gold coins, just waiting to be picked up. “You win by running, Mumma” he tells me, with an almost exasperated expression. Hmm…so you mean gold coins are not that important after all? Well, Did he just preach me the essence of life, a la Dalai Lama style, in his game lingo? Profound! Now I’m not a big proponent of video games or anything (And trust me, Temple Run is not paying me any commission either), but I find myself reflecting on this experience, and realizing, Didn’t he just learn about not giving up, taking calculated risks, and focusing on what’s truly important? I wonder if it would have been possible to teach him all this, if it had not been for the stimulating environment of the video game. More importantly, what chance do my sermonizing nags have against these entertaining mediums he’s learning from! So here’s my tip #1 for all the new-age parents: Teaching cannot be banal anymore. Either be entertaining, or be forgotten. I say, start looking for animation and speech modulation workshops, if you remotely aspire to impart any of your life learning to your children. By the way, energized by his valor, I decided to try my hand at Temple Running.I gave up after 12,455. I guess it requires focus and commitment. Wish I’d learnt that from him! Here’s my last tip on new-age parenting: Ask not what you’ve taught your children. Ask instead what have you learnt from your children!